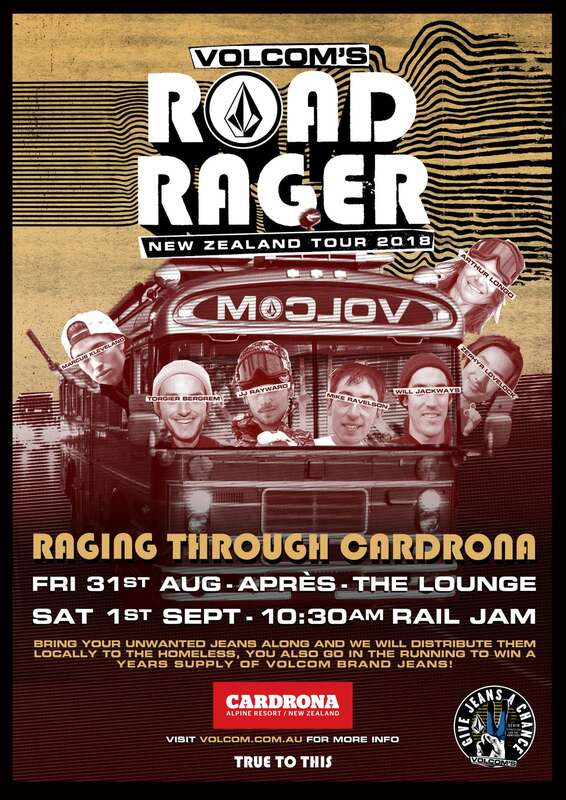 Volcom are bringing their Road Rager tour and Give Jeans a Chance program to New Zealand this August and September. Stopping in at Auckland, Raglan, Queenstown, Cardrona and Wanaka. 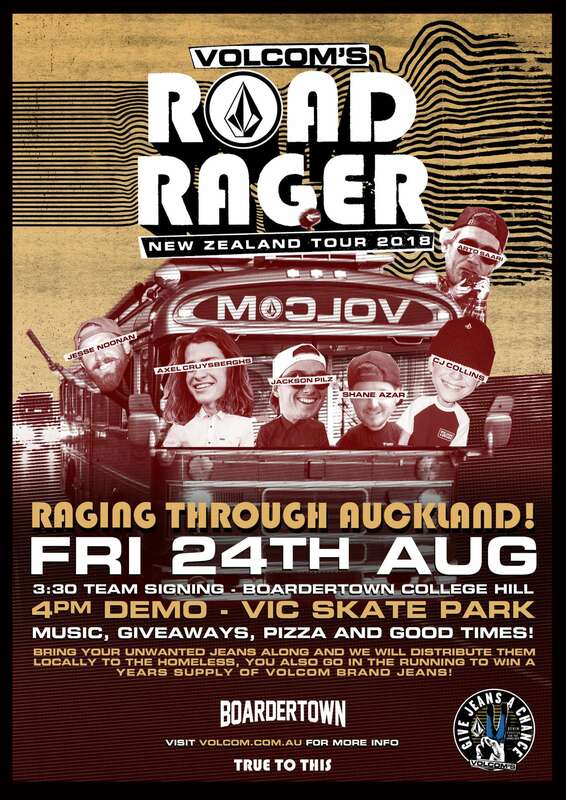 Volcom are bringing their Road Rager tour to New Zealand this August and September. A full-on, multi-disciplinary onslaught across skate, snow and surf featuring a who’s who of top talent. Joining the bus are Arto Saari, Mitch Colborn, CJ Collins, Noa Deane, Will Jackways, Jackson Pilz, Jesse Noonan, JJ Rayward, Axel Cruysberghs, Arthur Longo, Mike Ravelson, Torgier Bedrem, Ozzie Wright, Ryan Burch and Marcus Kleveland. While journeying across our shaky isles they will be demoing up a storm, and gathering up used jeans for their Give Jeans a Chance campaign, where they collect and gift used jeans to the homeless. Bring along your unwanted jeans to selected events and go in the draw to win a years’ worth of Volcom Brand Jeans. Friday 24th August, 3:30pm at Victoria Skate Park, Auckland. Signing and skate demo. 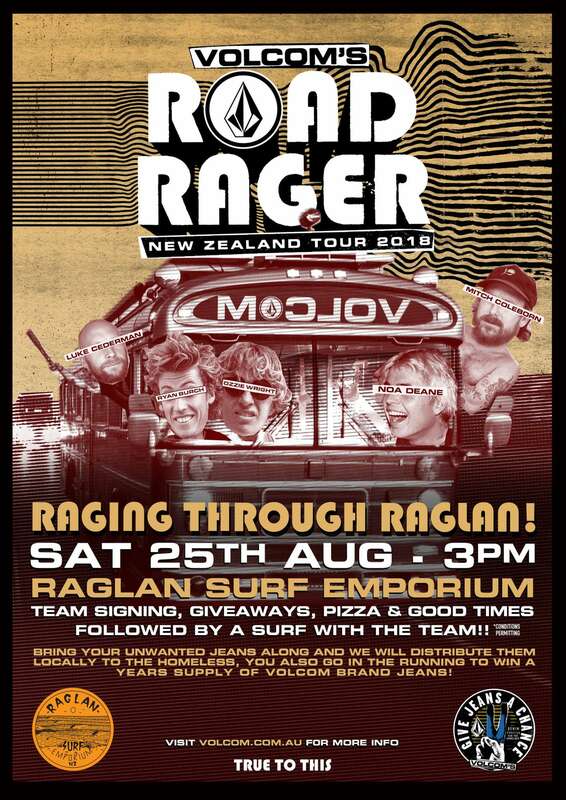 Saturday 25th August, 3pm at Raglan Surf Emporium, Raglan. Signing and surf session. 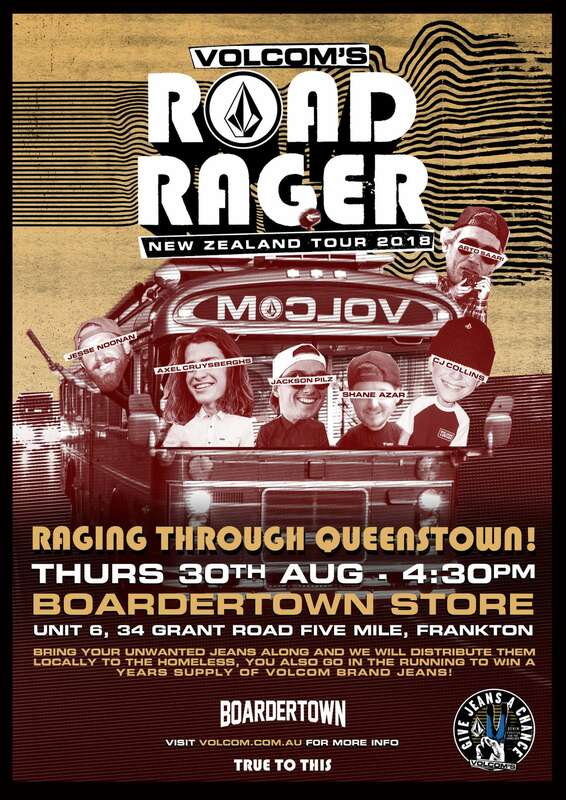 Thursday 30th August, 4:30pm at Boardertown Store Bowl, Queenstown. Skate demo. Saturday, 1st September, 10:30am at Cardrona Alpine Resort, Wanaka. Rail Jam. 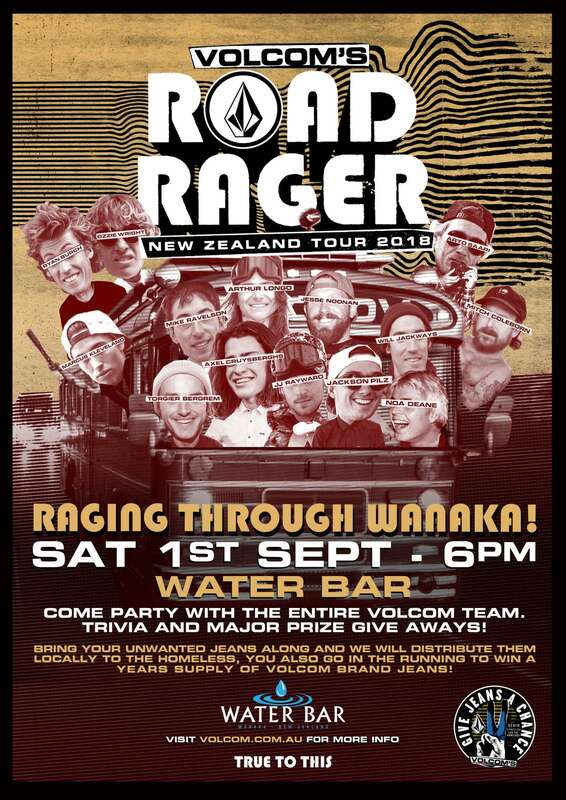 Saturday, 1st September, 6pm at Water Bar, Wanaka. Party and trivia night. Photos from the first New Zealand Vert Skateboarding National Titles in over a decade. Perfect location, upstanding shredding. Vans & Pass~Port back at it! Incredible leftovers from the Sour Solution II video. Gil Scott-Heron & Simon Jensen is a great combo. New Zealand’s best Vert Skaters descended on a practically undisclosed Wanaka location yesterday for the first National Vert Titles Competition in over a decade. Eighth Wonder the latest Daylight project from the weird & wonderful brain of Luke Browne into your retinas. A glimpse of Auckland's second House Of Vans, though the lens of Kingsley Attwood. Sweden x New Zealand venturing through the North featuring Simon Hallberg, Edmund Og, Simon Rex, Kyle Svensen and Decan. New additions to the WKND squad. Vans HOV Auckland is back! This Saturday the 23rd at Flying Fish Studios, all info is below. The finest skateboarding from Mangawhai Bowl Jam 2019 wrapped up into one succulent edit. Take a bite. A laundry list of our of southern brothers pack out this straight to DVD (in a good way) production by Majick Templeton and friends. The DC Super Tour is back! Dropping in this month to Auckland, Melbourne and Sydney. The Lopez Pro just got a new lick of paint. Another epic day of shredding in Magical Mangawhai. Here are all the highlights from the 8th Annual Mangawhai Bowl Jam. New Zealand is an exporter. Things get grown, refined and developed here and siphoned out into the world. Until recently it’s been firmly farm focused; dairy products, fibres shorn from woolly mammals, meat from less fortunate mammals.